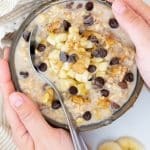 Overnight Oats Chunky Monkey Style! We're talking banana, nuts, chocolate & creamy oatmeal, because everyone deserves to wake up to that combo! There is no cooking involved at all. Make up a batch in minutes, store them in the fridge & they are perfect for quick, healthy breakfasts on the go! You need either 2 mason jars or 2 small bowls. Mash the banana with a fork. Add ½ to each mason jar or small bowl. Then add ½ a cup of oats, 2 teaspoons of chia seeds, a small pinch of salt, 1 date broken up into little pieces, 1 to 2 tablespoons of chocolate chips and nuts, ¾ cup (180 ml) milk to each jar/bowl. Maple syrup is optional. If you add it the oats are really sweet. I personally find it sweet enough without. Stir them really well, or put the lid on and give them a good shake. If using a bowl, cover with cling wrap. Transfer to the fridge and leave for at least 6 hours or up to 2 to 3 days. Eat straight from the fridge or warm gently if preferred. 1 tablespoon of cocoa powder added with the other ingredients makes for a great double chocolate chunky monkey oatmeal! Nutritional information is calculated using 1 tablespoon each of chocolate chips and walnuts.